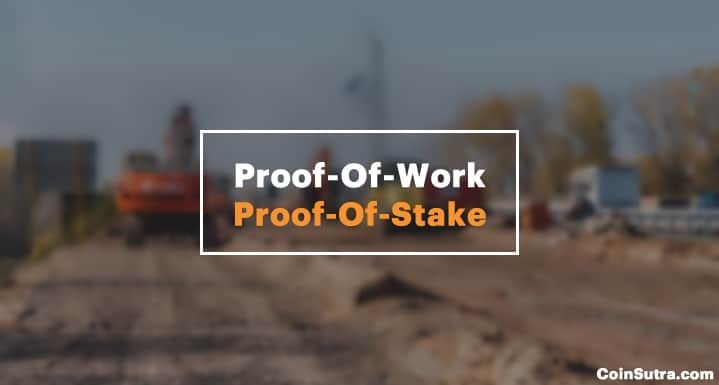 What is Proof-Of-Work & Proof-Of-Stake? Are you HODLing Bitcoin, Ethereum or any other cryptocurrency? If your answer is YES(!! ), then you might be interested in today’s topic of discussion. And I know many of you have given up trying to learn these terms because they are too technical to understand. But they’re actually fairly simple concepts. Proof of work and proof of stake are two kinds of computer algorithms that are responsible for today’s success of digital currencies like Bitcoin and Ethereum. Distributed consensus simply means a large pool of people who are geographically segregated agreeing on something. In cryptocurrencies like Bitcoin, ‘something’ here means agreeing on which transactions or blocks are valid and which are invalid to be added/rejected to the blockchain. Given the importance of consensus mechanisms, I think it is very important for technical as well as non-technical users to understand this behind-the-scenes mechanism of cryptocurrencies. So without any further delay, let’s get started. Proof of work is a computer algorithm which is currently used by cryptocurrencies like Bitcoin, Ethereum, Litecoin, and others to reach an agreement – or rather a decentralized agreement – around adding a particular block onto the blockchain. Hashcash (SHA-256) is the proof of work function that Bitcoin miners use to solve computationally difficult math problems in order to add blocks onto the blockchain. This hashcash function produces a specific kind of data that is used to verify that a substantial amount of work has been carried out. I consider proof of work to be an endeavor which eventually produces a single piece of data that fits into the Bitcoin protocol. It is time-consuming and computationally expensive. To understand it more thoroughly, let’s see the workflow which miners follow. To successfully mine a block, a miner needs to hash the block’s header in such a way that it is less than or equal to the “target”. The target, at the time of writing this article, is that the SHA-256 hash of a block’s header must be a 256-bit alphanumeric string, and must start with 18 zeros. The target changes as the difficulty change every 2016 blocks. The miners arrive at this particular hash (or target) by varying a small portion of the block’s header, which is called a “nonce”. A nonce always starts with “0” and is incremented every time for obtaining the required hash (or target). Since the varying of the nonce is hit and miss, the chances of getting this particular hash (or target), which starts with a lot of zeros, is very low. Therefore, many attempts must be made by a miner by varying the nonce, and hence, a lot of work has to be performed. This requires an enormous amount of computational power and hardware resources thus proving that a large amount of work has been carried out before mining any individual block. That’s why this is called “proof-of-work“. And in this way, whichever miner first obtains the correct Bitcoin Hash will win the mining reward of 12.5 BTC (plus fees). Proof of stake is an alternative to reach an agreement (or decentralized consensus). It was proposed by a Bitcointalk forum user in 2012 because POW required too much electricity and energy, and miners felt that mining a single block was a waste of resources. Also, a few studies have suggested that running and maintaining POW networks (like Bitcoin) is as costly as powering millions of homes in the US. Alternatively, POS is a much more user-friendly (and environmentally friendly) alternative to POW. In this type of consensus model, the number of coins you have stored in the system matters. The larger your “stake” is, the higher the chances are that you won’t breach the system (because you have a huge stake in its optimal performance). In POS, unlike POW, blocks are not mined, but are rather forged or minted. The participants who have a significant stake in the system get selected pseudo-randomly for forging and then adding blocks onto the blockchain. This pseudo-random selection happens after analyzing several different factors to ensure that not only people having a huge stake are selected, but others are also selected. Some of these selection factors are randomized block selection, coin age-based selection, masternodes, etc. POS is generally applied to those cryptocurrencies that are pre-mined so that users have access to the coins for staking. This means that the supply of POS cryptos are fixed from the start and there is no block mining or forging reward like POW. So the only incentive that POS forgers get is the transaction fee attached to that block. POW and POS both have their pros and cons. Also, many cryptographers and computer scientists are researching to find a better solution by evolving both of these algorithms. In my opinion, POS is cost-effective and environmentally friendly, but it too has some serious drawbacks that Vaitalik-like pioneers are trying to solve. Until that time, happy reading, learning, and sharing with the CoinSutra cryptocurrency community! Now I want to hear from you: What are your thoughts on POS and POW? Which one do you think is more useful? Do you know which consensus mechanism your favorite cryptocurrency uses? Let me know your comments, thoughts, and/or feedback in the comments section below. 1 What Is Proof Of Work (POW)? 1.1 What Is Proof Of Stake (POS)? Universality of HARD-FORK occurrences within the Proof of Work methodology gives clear, concise, modality issues that “happen”. Proof of Stake is just like its automotive industry Shade-tree mechanic installation of sound systems in vehicles might represent…just a POS. Incorporation of methods and procedures for all nuanced modalities are clearly being refined with HASHGRAPH, and Cisco systems utilization of alternative, more secure, less time requirement, with greater capacity to accelerate the flow of information INTO the Blockchain configuration (Gossip, and Gossip about Gossip), with a MORE SECURE accessing of TOD (Time Of Day) singularity. However, the current drawback is of course, the BAD GUYS. when they ATTACK in overwhelming numbers (Greater than thirty percent) the modality of HASHGRAPH is corrupted. Yeah, looking into hashgraph but yet not time-tested.